Learn what it takes to rent your vacation home and maximize your rental income. As a vacation rental home owner, you understand that you need to make your property stand out from the competition. To maximize your revenue, you need to offer amenities that wow guests. There are certain amenities you should consider absolute must-haves. But you can’t possibly offer everything that guests might want! So how do you know which options you should consider investing in? You may want to print this page to use as a resource. We’ve gone ahead and checked off those amenities that are must-haves, so be sure you haven’t forgotten any of those. If you come across amenities you already have, go ahead and check them off. Others you might rule out or decide against, which you can “X” off. And for the remaining ones you’re taking into consideration, we’ll offer a few comments to help you weigh your options. Enable your guests to stay connected. Wi-Fi these days is an expectation, not an added bonus. Unless your rental property is a cabin in the woods and your whole marketing angle is to highlight disconnecting from the rest of the world, you should be offering it. High definition television is a must have for this generation of tech-savvy guests. Consider having TVs in multiple areas, including the master bedroom. Guests will expect cable or satellite service, and being able to connect to their favorite streaming service, like Netflix, Hulu, or Amazon Prime, is a nice bonus. Movie night! Yeah! Who’s making popcorn? Apart from having a surround sound audio system in the main TV room, you might offer something like a Bluetooth speaker that allows guests to play their favorite music from their phones or mp3 players. For movie nights, of course! Time to get rid of that old VHS player. Along with a high definition TV, guests want to be able to watch movies in Blu-Ray quality. You might also consider having a small library of family-friendly movies on DVD or Blu-Ray. It’s more convenient for guests to be able to control multiple entertainment devices with just one remote. Leaving instructions for how to set things up, such as how to switch input from watching cable TV to watching a Blu-Ray movie, is also very helpful. That way guests unfamiliar with your specific devices don’t have to go searching through menu options or playing around with settings to figure things out. Especially if you are marketing your vacation rental to large families, having a gaming console like Nintendo, X-Box, or PlayStation is a nice bonus for your guests to find upon arrival. Include an assortment of family-friendly games. You might not want to build an addition for it, but if you have the extra square footage in your home to do it, you might consider having a dedicated media room providing a more theater-like experience. As an alternative to a large-screen HDTV, high definition home projectors are reasonably priced these days. Floor space is also a determining factor for this one, but if you have the room for it, pool tables are always a nice bonus for guests to find upon arrival. Alternatively, you could add a ping-pong table. Or, hey, if you can accommodate both pool and table tennis, go for it! Your guests will be thrilled. Well, you might not be able to turn your backyard into a golf course, but if your vacation rental is in a private community where guests can enjoy amenities like golf or tennis, or if there is a public golf course or tennis court nearby, you should definitely mention it! A swimming pool is an obvious draw for guests. Here in northern Michigan, while installing a pool might not be the most practical addition to your property, a hot tub is more doable and has appeal no matter the season. A sauna is another amenity that adds a ton of appeal to your home. Guests coming “home” from a day exploring the area’s attractions might like to spend the evening putting in some additional quality family time. You can help them by offering a selection of fun things to do for both kids and adults; like games, puzzles, and playing cards. A small library of books is also a good idea, for anyone who wants to just kick back quietly. Consider including books about your area with nice color photographs to inspire them. Also consider including local authors or stories. You can also pull one or two off the shelf for the coffee table, where they are sure to be seen and picked up by allured guests. Let’s talk about the kitchen next because it’s a primary consideration for renters. Being able to save money eating in, is one of the benefits that leads travelers to book a vacation rental, rather than staying at a hotel. Guests will look for a space with a practical and open layout. Those cooking something up in the kitchen will want to be able to converse with their group or just keep an eye on the kids. Apart from the layout, there are any number of items you could have in the kitchen that will appeal to those who want to dine in. An updated, modern kitchen has high appeal to guests. Consider stainless steel appliances, including refrigerator, dishwasher, and range. Be sure to provide dishwasher detergent, and also keep ice stocked in the freezer! Help your guests start their day by having a coffee maker. Oh, and don’t forget the coffee. Offer your guests a couple options. It’s better freshly ground, so you might want to have a coffee grinder and offer whole beans instead of pre-ground bags. In addition to a regular coffee maker, you might want to have a stainless steel French press or percolator for connoisseurs who prefer to brew it that way, or a Keurig for those who value convenience. Enable guests to relax with a hot cup of tea. Either a stainless steel stovetop kettle or an electric glass kettle will do. Also offer an assortment of different teas. Also remember to have a bowl of sugar for those who like to add it to their tea. Sure, you can cook rice in a pot, but it’s so much easier with a rice cooker. Whether it’s for a morning smoothie or an afternoon cocktail, a good quality blender capable of crushing and juicing will be a welcome amenity for your kitchen. Make sure you have sufficient plates, glasses, wine glasses, coffee/tea mugs, and silverware for your guests! Oh, and don’t forget the multi-purpose bottle opener (for both bottle caps and wine corks)! Also be sure to provide guests with cutting boards and utensils like a good quality knife set, spatulas, serving spoons, measuring cups and spoons, and a multi-purpose grater. Stock frying pots and pans, but make sure they are not Teflon coated as this chemical coating poses a health hazard. Aluminum cookware is also a health concern because aluminum is toxic and can leach into your food. Your best bet is stainless steel because it’s safe, durable, and easy to clean. So that your guests can prevent sticking without chemically coated pans, provide healthy cooking oils like extra virgin olive oil and coconut oil. Also provide mixing bowls, glass baking dishes, and baking pans. An assortment of spices would also be welcomed by those wishing to cook in, but at a minimum be sure to provide salt and pepper! Your guests wishing to dine in will need washcloths, kitchen towels, pot holders, and oven mitts. Don’t forget these essentials! Also have plenty of paper towels on hand. We already mentioned to be sure to provide dishwasher detergent, but even if you have a dishwasher, your guests may still want to wash some dishes by hands sometimes, so enable them to do that by having a dish soap dispenser (and sponge! ), as well as a hand soap dispenser. Additionally, you could keep a hand lotion by the sink for guests to avoid dry, cracked hands after cleaning up. Sometimes it’s the obvious things that get overlooked! Be sure to have a trash receptacle in your kitchen in an obvious and convenient location, such as under the kitchen sink. And don’t forget to stock properly fitting garbage bags. Having a kitchen table or bar can improve your guests’ experience in several ways. It provides extra space for setting things down, extra seating for large families or groups, and a place for people to congregate and chat while the chefs are in the kitchen. An open design is also desirable for guests so people in the kitchen can stay connected with their group or keep an eye on the kids while preparing food. It’s another one that may seem obvious, but can be overlooked. Be sure that your guests wishing to dine in have plenty of cupboard or pantry space for their groceries! Your guests will want an inviting and comfortable place to rest their weary bones after a hard day of vacationing. Provide them with a good quality mattress with a mattress cover, high quality white bed linens, pillows and pillow protectors, and coverlets. Your guests may want to relax in bed reading, so you should have night stands with reading lamps. Also provide guests with an alarm clock. It’s also a good idea to have an emergency flashlight in the night stand drawer, just in case of a power outage. Here’s another one that might be easily overlooked. Be sure your guests will have plenty of plastic clothes hangers so they can unpack and make themselves at home. Yeah, we covered this already, but it’s worth mentioning again that, in addition to the main entertainment area, you might want to have a TV in other rooms as well, including the master bedroom. Although many guests may prefer to bring your own, shampoo and conditioner are not items they will generally expect to have to pack along. Be sure to provide them. As in the kitchen, provide hand soap for the bathroom sink, as well as soap for the bathtub or shower and body lotion. Provide your guests with at least one set of good quality white towels for each occupant. This is another item guests will not expect to have to pack along, so provide one for them. We already mentioned keeping paper towels stocked in the kitchen. Guests will also want to be able to easily find the broom and dustpan. Make sure they are in an obvious and convenient location for quick access, not hidden away somewhere. You don’t want your guests to have to hunt around the house for these kinds of items, so you might also want to make a note of their location in your welcome packet. While your guests aren’t there to make your vacation home spick and span for you, if some cleanup becomes necessary, they’ll want to have the tools for it. As with the broom and dustpan, you may want to leave a note in your welcome packet letting guests know where to find the vacuum. Trash receptacles in the kitchen, bathrooms, and bedrooms fill up, and your guests will need waste disposal bins to empty the accumulated trash into. If your vacation home is in a northern environment, be sure to keep a snow shovel in an intuitive location like the garage so guests can find it to get their vehicle out or clear the walks if necessary. Of course, the driveway and walkways should be cleared prior to their arrival. But you can’t control when it snows, and your property maintenance person might not be able to take care of it right away, so be sure to leave your guests with the tool they’ll need for the job, just in case. While your guests are likely to have their own cell phones, it’s still a good idea to have a telephone in your home, just in case they do need to use it, and especially if there is poor cell service in your area. You may want to set up long distance call blocking. Also keep a list of local emergency numbers by the phone. This is a big one, among the top amenities guests look for in a vacation rental. Especially for longer stays, your guests will want to be able to do their laundry without having to spend half their day running out to the laundromat, be sure to leave some detergent and dryer sheets nearby as well. Help your guests keep looking their best! Who wants to go adventuring in wrinkled clothes? Let them keep it in style. While you might not expect it, a fireplace is a commonly searched for amenity for vacation rentals. It’s a nice touch for guests to be able to relax around the warmth of a fire in the evening, especially after a long day on the slopes. Try and have some firewood stacked by the fireplace or in the garage! Air conditioning is another feature that guests look for in a vacation home. If you don’t have AC, you may also consider installing ceiling fans or otherwise providing electric fans for those warm summer days and nights. Smart home devices like TVs with streaming services, thermostats you can adjust remotely, and smart key locks for check-ins are increasingly trendy. If your home is handicap accessible, be sure to mention it in your listings. According to Tripping.com, it ranks among the “most value added” amenities. Welcoming your guests to bring along their furry friends could help you get more bookings. Many vacationers search for vacation rentals that are pet friendly. On the other hand, guests with allergies would want to seek other accommodations. You’ll have to judge based on your own individual circumstances whether advertising your home as pet friendly would be a good idea. This is another one listed by Tripping.com as a top “value added” amenity. If you rent to larger families or groups, having enough places to park their vehicles is important. If you have a garage, leave your guests the remote opener! In addition to ensuring that you have smoke alarms installed in your home, be sure to routinely check the batteries and replace them as necessary. Carbon monoxide poisoning is a leading cause of accidental poisoning deaths in the US. The National Fire Protection Agency (NFPA) recommends placing carbon monoxide detectors on each floor of the home and outside of sleeping areas, such as in any hallway with adjoining bedrooms. The Centers for Disease Control and Prevention (CDC) recommends having any fuel-burning appliance professionally serviced annually, including your furnace and water heater. If you have a fireplace, a blocked chimney could cause carbon monoxide to build up inside your home, so have it checked or cleaned annually. This is another must-have that you should not overlook! Another highly popular amenity that will help you attract guests is an outdoor grill. Some people prefer gas while others prefer charcoal. One of each would be ideal, but if you’re going to choose one, since gas grills are more convenient, that might be your best bet. You’ll need to keep it cleaned and maintained, and don’t forget to provide charcoal or propane, as well as grilling tools! Apart from a grill, your guests might have fun roasting hot dogs or marshmallows or just enjoy chatting around a campfire. Who wants to stay indoors all the time, especially on vacation? Decks, porches, and balconies all add appeal to a vacation rental. Invite your guests to enjoy the fresh air with outdoor furniture, including patio tables, chairs, and chaise lounges. Also be sure your flooring and railings are maintained and up to building code! There’s not much more relaxing than gently swinging all your worries away in a hammock. Of course, the kids will love it, too! Beautiful landscaping and well-maintained grounds make a great first impression, both in your property photos and when your guests arrive. If your home is on the beach or has beach access, it’s a good idea to provide your guests with a few basic items to help them have an even more enjoyable time. Provide beach chairs, an umbrella or two, beach towels, and maybe a few play items like a beach ball. Greet your guests as they arrive with a package welcoming them and providing any information they should know about your home. A gift basket is a nice additional touch. This might include items like an assortment of teas or a bottle of wine that they can enjoy during their stay, or perhaps something like a photo frame they can take with them to feature their best family snapshot to remember their vacation. Some additional things you might include with your welcome package are maps or guidebooks showing local areas of interests. You could also make a note of your own recommendations for places to visit, including your favorite local shops, restaurants, recreational areas, or other attractions. Which Amenities Will Your Vacation Rental Feature? 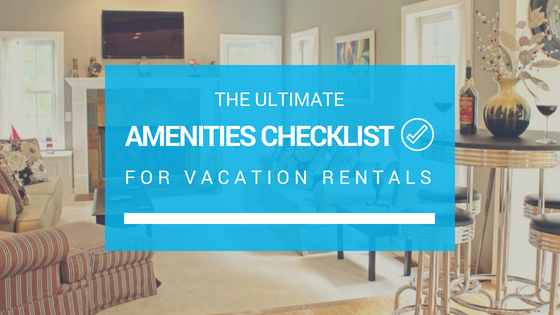 We hope our comprehensive amenities checklist has given you some good ideas for investments to make to increase the competitiveness of your vacation rental and maximize your rental revenue. Which are you going to add to your property? Did we leave any out that you think we should add to our list? Share your thoughts in the comments below! Jeremy Hammond loves the northern Michigan outdoors, and his hobbies include hiking, biking, exploring, and photography. He does technical stuff for Holiday Vacation Rentals like helping to ensure a great user experience on the website. He enjoys researching and writing and also contributes to the HVR blogs. A rental business is a good business to invest with. There are lots of steps to follow in order to make it a success. Thank you for sharing these helpful tips! This one very informative. Good to know about this list of amenities to look for in vacation rentals. Thanks. 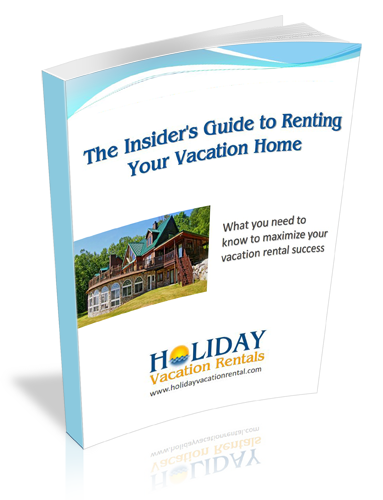 ​Quickly learn what it takes to achieve success with our Insider's Guide to Renting Your Vacation Home. How Can Short-Term Rentals in Michigan Be Regulated without Violating Property Rights? What Does Expedia’s Acquisition of HomeAway Mean for Vacation Rental Home Owners?